The first time I caught sight of Margie was late in the springtime. I was walking through the dining room and happened to look out the windows and there she was, just beyond the Nandinas. It was startling to look out and find someone looking back. We both stood perfectly still for a moment, pretending not to notice the other. I crept quietly to the window to get a closer look. She was beautiful and delicate like a ballerina with long thin legs. I stood there and spied on her for quite some time watching her steadily knitting and knitting the most stunning circle of lace you ever saw. At the end of the day she was still there. And she was there again the next day. And the next day and the next day after that. We didn’t know what her name was so we just started calling her Margie and that seemed right. Every day of the summer, Sean and I ran to the dining room windows first thing to see if Margie was still there and to watch the morning sun cast its pink and then yellow glow across her glossy web. And every day she would be there, noiseless and patient. No matter what kind of harsh weather the Texas skies served up — hot and sunny or rainy and windy – Margie stayed put, confident that she was where she was supposed to be, doing what she was supposed to be doing. The days are growing shorter now. The leaves are beginning to turn brown and occasionally one will spiral softly downward. Another season of life is upon us. One morning, we will look for Margie in the window suspended between the earth and sky and she won’t be there. All things come to completion. There are probably many lessons that can be drawn from watching a spider all summer, but for me, in this season of my life where patience eludes me, Margie has taught me that there is beauty in being noiseless and patient — no matter what life serves up. I believe Margie had a son for a while. He just sort of showed up one day, small and brown. He would hang out in the far corner of the web. We named him Jack. Then one day Jack was gone. I think Margie ate him. I can understand why. I am fairly certain that Margie’s grandmother is living outside my bathroom window. I must send her picture! Identical spider. I am just glad it is on the outside. Isn’t nature wonderful? Mostly, isn’t being a mother wonderful? Enjoy reading your stories…. My 7 year old son just got done reading Charlotte’s Web. It was one of my favorite books as a child. Amazing how I grew up and think of spiders as creepy now. The picture of Margie is very beautiful. As long as she is behind the glass and not crawling toward me in the bathroom…eeek!! Wow AM, well-done! Thanks for sharing. We have a couple of little spiders who spin their webs in the same place each night. Some nights the kids and I will go out and watch in amazement. I guess it’s true that even a spider can teach us all something. Beautiful post, beautiful analogy, but the spider is gross, and I surely couldnt have watched that spider everyday.I however did love the story Charlottes wes and read it faithfully to my children several times all the way through, but real spiders freak me out. I so enjoy your blog. I believe I will be a regular visitor. This is so beautifully written. I found myself inwardly slowing down to the patient rhythmn of Margie. I think the Lord has so many lessons to teach us through the simple beauty of His creation. It is so sweet that you got to share all of this with your little guy. You made a lovely post but I have to admit, I hate spiders and Margie wouldn’t have lasted a day in my window. A spider nearly killed my kitten. What a great point. Just beautiful. My Mama taught me to respect all of nature’s creatures, and some of my fondest memories are of looking for the garden spiders, or writing spiders as we called them, every day. They were just like Margie so I suppose each region has a different name for them. 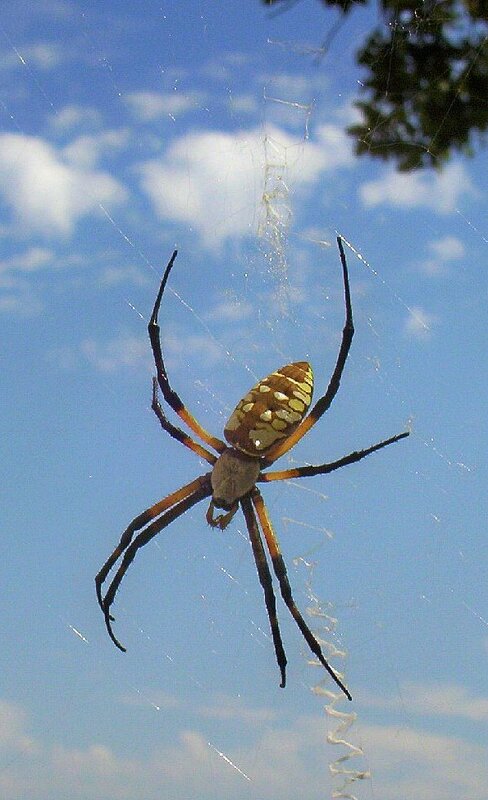 We had a banana spider or golden silk spider like that outside our kitchen window the past two summers, and I grew quite fond of her, too. Somehow seeing her out there every day doing what she was made to do reminded me of how I needed to do the same. Loved this post. What a great way to mark the season. Beautiful post (even if spiders do creep me the eff out). Great experience to share with your son. Teaching him enjoy the beauty and to be respectful of nature is a good thing. I find spiders to be scary myself, maybe my mom didn’t do so good in the nature teaching arena, but I have a healthy respect for it anyway. Lovely entry! Julia and I have been watching a spider at the side of our house this summer. I have yet to capture a good picture of it. Your photo is exceptional! Wonderful post. I too, have been watching a spider in my garden for quite some time. Although we don’t have the “zipper” spiders that you do (round here we call them “orb weavers”) ours also built beautiful webs. What a wonderful reflection on steadiness and steadfastness. I needed that reminder today. My thought at the end of the post? What an application to our Christian walk. “…stayed put, confident that she was where she was supposed to be, doing what she was supposed to be doing.” How much easier it would be if I held that confidence to just do what it is that I am to do. Thems wise words, AM, no matter your stage in life. We lived in the country and raised horses for twenty years and had this exact type of “Margies” in our mulch beds. After happily spinning their gossamer threads around the deck and hottub, they would find their way into my basement when the frost was on the pumpkin and on the Margies. Gossamer is one thing, but hiding among my laundry piles was another thing! You make it sound lovely—no running and screaming from AM and Sean. Watch out or he will be bringing icky things home in his pockets before very long. Little boys are like that! A spider once built a web on my car, between the side mirror and the driver’s side door. I took a few long highway trips but no matter what happened, the spider was always there. And then one day it wasn’t and I was amazed at how much I missed him (her? I always thought of that one as a him, though the one on my front porch was named Charlotte). Fantastic picture and a wonderful sentiment to go with it. The boys and I read Charlotte’s Web together this summer and your story is sweet and sad in a way, just like CW. I am admiring you with the heebiest of jeebies. Great lesson learned…but I have to admit that looking at the picture gives me the chills. I hope you can enjoy Margie for a while longer! Thanks for sharing your story about patience. That is one thing I need to work on more…maybe God could provide me a spider to watch! I think spiders are fascinating, my girlboy husband, however is terrified of them. I have a spider I’ve been watching too! It’s kinda creepy, and I haven’t named her, but I can’t bring myself to have her removed either. I’m not sure what kind it is, but it is HUGE and brightly colored. I have to admit that the fact that it creeps my sisters out makes it all the more enjoyable. Margie is a great name for a spider. We have enourmous Wolf Spiders in and around our house, and while I have no idea how patient they are, they ARE super creepy. But Margie sounds endearing, for a spider.